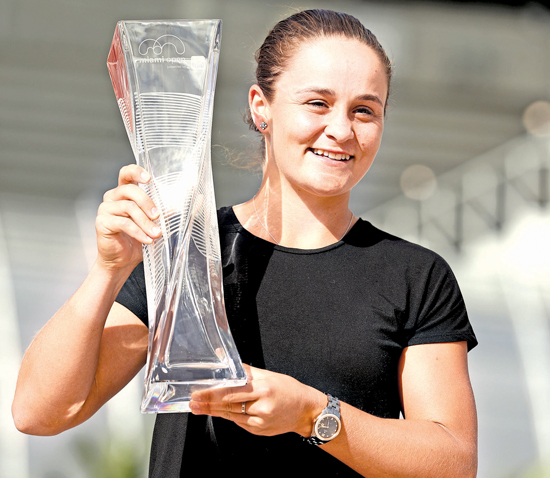 MIAMI, Saturday - Australia’s Ashleigh Barty blasted a career-high 15 aces Saturday to win the biggest title of her career, defeating Czech Karolina Pliskova 7-6 (7/1), 6-3 to capture the WTA Miami Open. The 22-year-old Aussie, who will jump into the world rankings top 10 from 11th, claimed her fourth career WTA singles crown after victories at the 2017 Malaysian Open and last year at Nottingham and Zhuhai, China. “It has been a phenomenal two weeks,” Barty said. Barty, who took home a $1.3 million top prize, lost her only prior WTA final this year in January at Sydney to Czech Petra Kvitova in a third-set tie-braker. Seventh-ranked Pliskova, who ousted Barty in the fourth round of last year’s US Open, failed to claim her 13th career title and second of the year after Brisbane in January.